We promptly started ripping it apart and it reached a point where there wasn’t a nice space in the whole house. 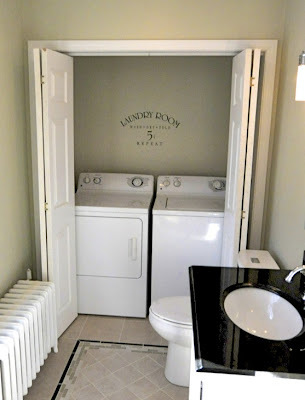 For whatever reason, the first room we renovated was the power room. 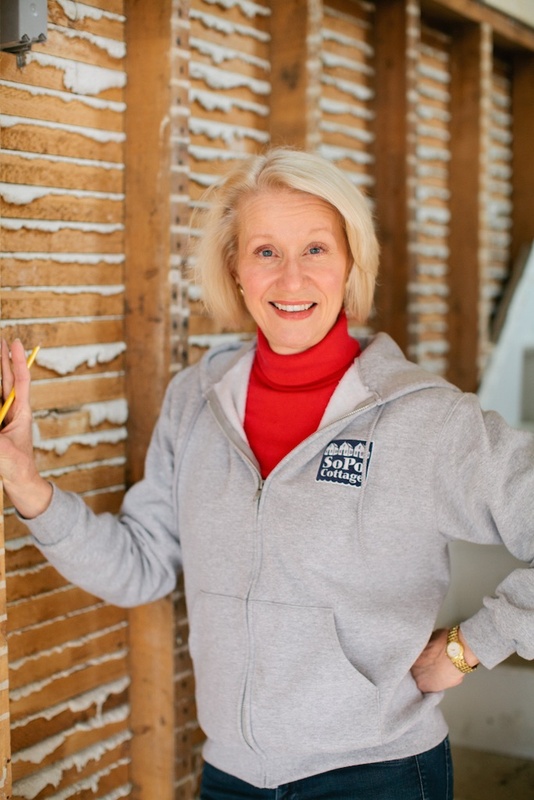 It was an oasis of calm and clean – in the tiniest room in the house. Some days I would just go in there to hang out….to remind myself that the rest of the house, too, would ultimately look that nice. It was just a matter of time! Oddly enough, that’s the first room that’s going to get transformed in our Victorian flip house. It's at the back of the house, in a space we think was originally a porch. 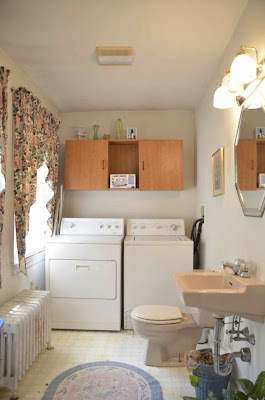 This is more like a utility room, because it has the washer and dryer in it as well. But we’re going to try and hide them behind doors at the back of the room. That way, the rest of the room might seem a little less utility-like – and you can hide any dirty socks behind the doors. Since this is right off the kitchen, we want to tie the color schemes together. 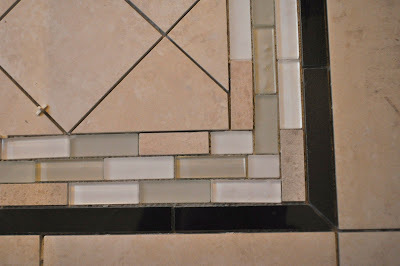 We installed a glass and marble mosaic ‘rug’ border, that will match the one on the backsplash in the kitchen. 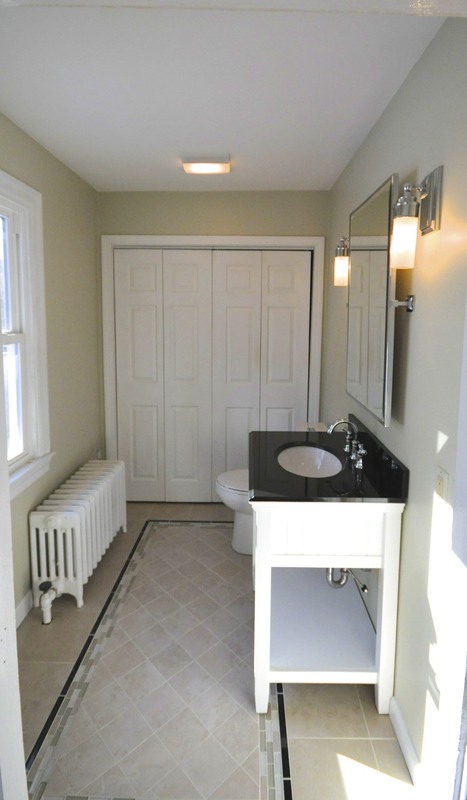 And to keep it from being too monochromatic, we added an accent strip of absolute black granite - which links to the black lavatory countertop. 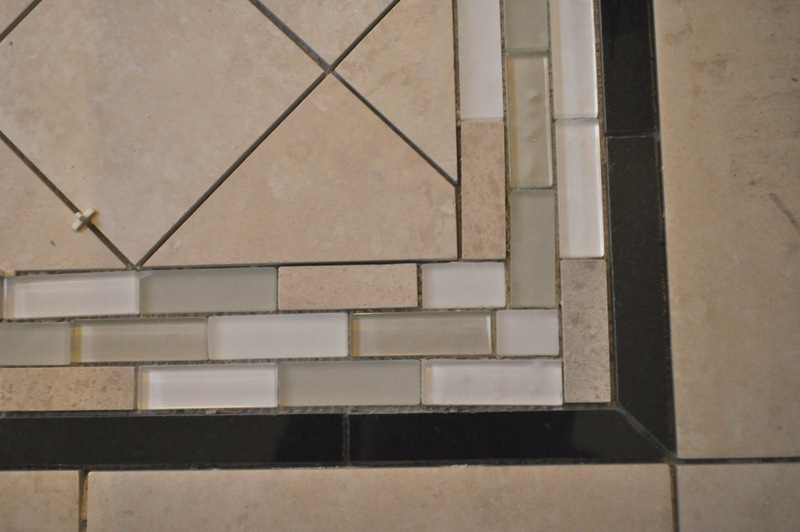 The rest of the floor matches the marble that’s in the mosaic border. The result? It's still a work in progress, but we think it looks pretty nice. And if you stop by the house looking for me, you might find me hanging out in the powder room! You really are good at this. It looks terrific. Better than sitting in a boring, eye stabbing meeting! Thanks so much! I'm lovin' our new career path!!! Lovely and functional too! Great job and keep up the optimism! Thanks Sally, appreciate the support. We'll be 'staging' the house for sale, so there is more to be done....but it's great progress! The flooring absolutely rocks my socks off! Thanks so much!!! 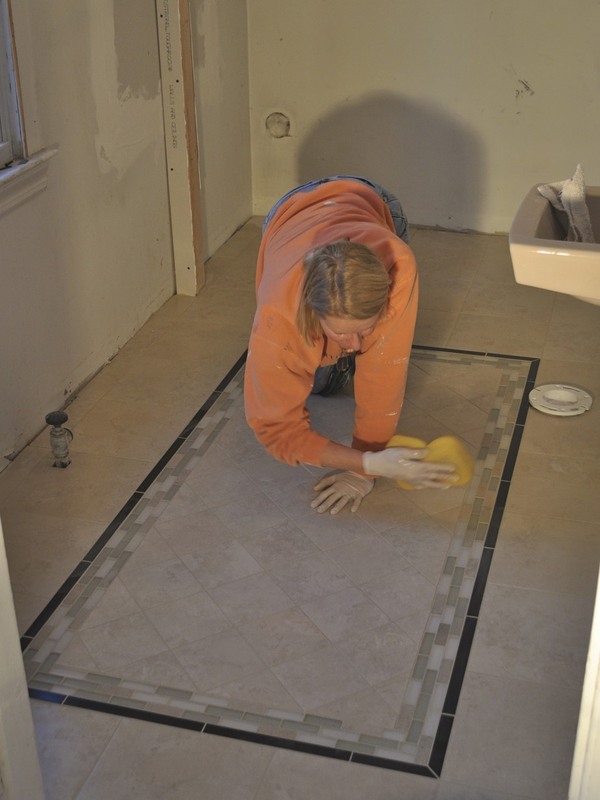 I love doing interesting tile work, it makes such a dramatic statement in a room. And figuring out how to weave the corners together made this one particularly challenging! I'm blown away at the transformation! It's so creative and it came out beautifully! Thanks Joslin! We're starting our next project later this week - so lots more adventures to come! Thanks so much for your note Sandy. Actually, it sold in 3 days and we've already turned it over to the new owner. 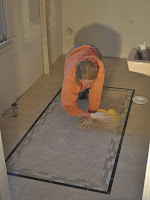 There are some photos of the 'after' rooms in some of the more recent blog posts. And we'll be starting a new one next week! Imaginary Family - Need Your Help!